I had the great privilege of hearing Kathy Hedge share her insights and great strategy on Board fundraising. 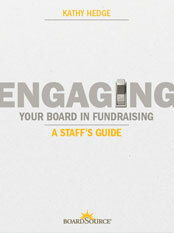 Her book, Engaging Your Board in Fundraising: A Staff’s Guide available through BoardSource is worth purchasing. I have a written quite a few posts on Board fundraising on this blog. Hope you find them useful as well. Entry filed under: Board Development, Fundraising. Tags: Board engagement, Board fundraising, Empowering your Board, empowering your board to succeed in fundraising, Staff board partnership in fundraising.